What a cute little set for your little one to be able to mimic what their parents do. We love the wet sign the best, but all of the pieces are great representations of the full size product. 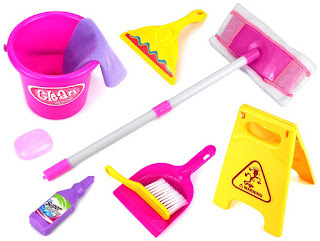 The only thing you need to put together is the mop all of the other pieces are ready to play with. This would make a great companion to a kitchen center, or a play vacuum cleaner. Set is sized for a smaller child my 7 year old had to bend over to use the mop but all other products were sized well. You can find this Little Helper toy on Amazon. What Velocity Toys has to say about their product. Perfect for Pretend Play or Role Playing! Approx. Length of Mop: 20"
Approx. Height of Bucket: 5.5"